Podium placements were in abundance for MA athletes at the 73rd annual New England Championships. The Bay State collected seven victories for the day and a handful of runner-up finishes at Saturday's meet, held on the campus of the University of New Hampshire under somewhat windy conditions. In a controlled race, Newton North's Andrew Mah claimed his second straight individual crown in the 3,200-meter run. Mah broke from the pack after the first mile and won with a time of 9 minutes, 16.97 seconds. The MIT-bound senior passed through his opening mile in 4:44. Hopedale's Brandon Hall, who did the early pace-setting, was second in 9:26.19. Richmond Kwaateng of Lowell, who won his first individual 100m title at last week's All State Meet, added a New England crown to his resume with a time of 10.93. He edged Oakmont's John Caouette, who was timed in 10.98. Westborough's Ethan Clark (third, 11.07) and Hudson's Michael Blake (fourth, 11.08) took the next two spots. Coauette came back later in the meet and earned gold in the 200m dash with a time of 21.95. Wahconah's Matthew Lighten was second at 22.09. In the girls' 4x100m, Natick's foursome of Abigail Gerdes, Rachelle Parker, Kylie Langan and Mackenzie Burgoyne combined for a winning time of 48.74. Sharon collected two first-place finishes in the girls' events. The Eagles' Shira Stoller captured the javelin with a heave of 143 feet, 3 inches. Stoller's teammate Jada Johnson won the long jump with a leap of 18-7.25. Anoush Krafian of Belmont dipped under 15 seconds to finish second in the 100m hurdles. She crossed then line in 14.88. 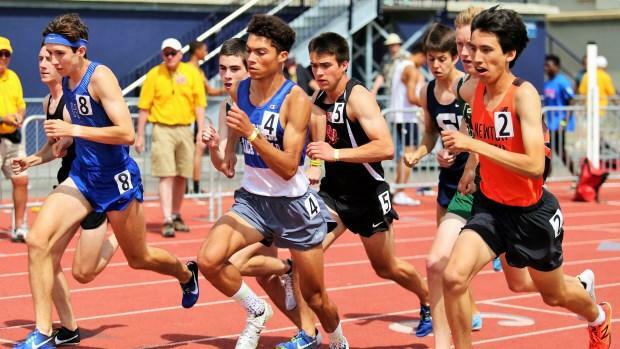 Theo Burba of Newton North, last week's 800m state champion, took third overall in his specialty with a time of 1:53.74. Blomfield School's Chloe Alfieri was second in both the 100m (12.26) and the 200m (24.68). Sophie Wright of Cambridge Rindge and Latin was second overall in the triple jump with a distance of 37-4.25. St. John's Prep's Nate Hobbs took runner-up honors in the triple jump with a leap of 47.3.5. He was followed by Putnam's Nasishawn Jerniga, who was third at 47-0.75. Shepherd Hill's Emma Sullivan (third, 2:11.89) and Tewksbury's Rachel Sessa (fourth, 2:13.56) made it to the podium in the 800m run.